The Regtech Supplier Performance Report 2016, published by Market Fintech Limited and supported by Banking Technology, estimates that more 189 global financial institutions have deployed a range of new regulatory technology (regtech) solutions from 20+ specialist suppliers in just a couple of years. The UK 2015 budget announced that the Financial Conduct Authority (FCA) would work with the Prudential Regulation Authority (PRA) at the Bank of England to identify ways to support the adoption of new technologies to facilitate the delivery of regulatory requirements, i.e. regtech. This report focuses on what solutions are gaining market traction and where in the world, what types of institutions are deploying them and why, plus scope of solutions and areas of compliance addressed. The report provides regulatory technology buyers with the required performance data on RegTech solution providers in order to make an informed decision. Identifying the right players is a first natural step for many organisations when making a major purchase decision. And up until now, there has been no resource that accomplishes this in any factual way. In addition, many of these regtech solution providers are privately held, and privately held companies aren’t required to report their revenue publicly and revenue is not broken down by product. Presenting the report’s finding, Tina Snelling, CEO, Market Fintech Limited says: “As fintech participants we are all keen to support and understand the adoption of regtech solutions and innovation in the global financial services and banking industries. “This new performance report delves into the actual performance of the multitude of regtech solution suppliers and is of particular interest to financial firms looking to adopt new regulatory technologies. Marc Murphy, CEO of Fenergo, comments: “Most financial institutions are characterised by fragmented processes, siloed data and an overall lack of client visibility across the client lifecycle management process spanning different business units and jurisdictions. Ben Richmond, founder and CEO of Cube agrees. The inability of “decades-old manual processes” to address the challenges of the “exponential increase in the volume and complexity of regulations”, coupled with “massive increases in data and the need for automated compliance processes” means that financial institutions “need to take a new and transformational approach”. One of the first tasks in regtech is taking control of the data. Ian Chester, director at Message Automation, says a regtech solution should provide “clients with a deployed single data model from which they can view and control all of their post-trade derivative activity”. A spokesperson for Alyne observes that “consultants will provide regulation lists, in PDF formats, which they often sell for hundreds of thousands of pounds or euros, even though working them into an automated solution is a massive task. How does the report rank the suppliers? The report authors have developed a custom formula that was used to rank the solutions in the overall ranking and for each category and section. The formula is simply based on year established, number of total users, and product go-to-market dates. AML: who ranks highest in knowledge among compliance practitioners? 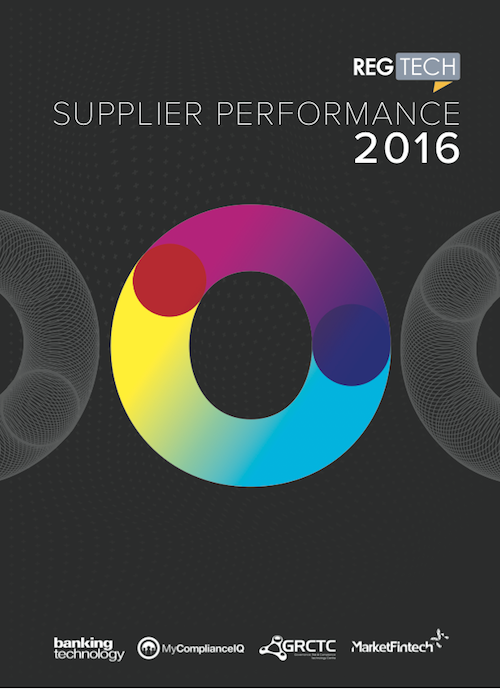 2017 Regtech Supplier Performance Report is now available. Click here to view it. Want to know more about regtech? Read our free article, Regtech: from regulatory compliance to competitive advantage. In this comment piece, Subas Roy, director in EY’s financial services practice, explains how regtech can help and how to avoid the pitfalls.